Really into these guys at the minute. Stumbled upon them via the radio, and have had this track on repeat since. Slightly lost about how to describe their sound, somewhere between bluesy / rock vocal with a deep dubsteppy bass line and playful beats over the top of it. It is a tune however you describe it. The album, entitled Megalithic Symphony, drops March 15th(or 29th). So sick, on my way to buy the album right now. I LOVE the feel of this song….I want it to wash over me all day. Radio also clued me into it, but I had to search a bit to find out what it was called. Now that I have it, I never want to let go! Love the deep dubstep feel above all else…. Caught AWOLNATION at SXSW, best performance of the festival…well that I caught anyway! Went home & bought the cd, it is like an addiction, I can't stop listening. I am not even sure which song I like best because they are all good & all so different! Blame it on A.D.D. Baby, great song! Fantastic .. absolutely amazing! I heard this on the radio a few months ago and became an instant fan. My workplace has blocked most music sites .. thanks for being available to me. And Kudos to you for posted this masterpiece. A view on the average life and expectations of an American or Canadian citizen .. blame it on the ADD, baby!! everytime i get on, i have to upload this song. I blame it on my A.D.D. baby"
This song is truly awesome. Heard this song at work…..now stuck in my head. I loooooove the beat. 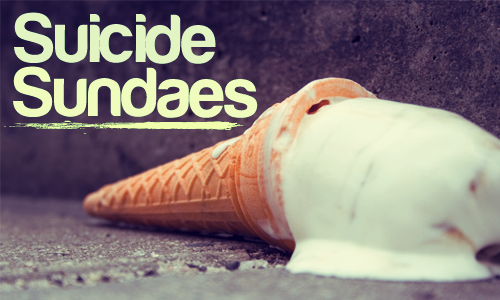 AWOLNATION – "This Kid's Not Alright"
Suicide Sundaes – Week 84 Presented By Night Rumour New York Launch party!